We officially began our winter semester by offering two new courses. These were Biblical Research and Interpretation which drew eight students and Foundations of Biblical Thought which drew 17 students. Paperwork was filed with IRS in pursuit of an independent 501(c)(3) standing for NPBS. Two administrative actions were taken regarding our standing with the State of North Dakota. First, in preparation for filing for an NPBS independent 501(c)(3) status, Articles of Amendment were recorded with the Secretary of State. These defined NPBS as a Christian theological education corporation organized exclusively for charitable and educational purposes. Second, the Northern Plains Biblical Seminary registered the Trade Name "Northern Plains Bible School." Under this moniker we will be able to operate a Bible School for those who are not ready or prepared for a Seminary education. Two important documents were finalized to make certain NPBS was under the umbrella of a 501(c)(3) organization. A Memorandum of Understanding and a Fiscal Sponsorship Agreement were signed by the President and Vice President of NPBS and the Chairman of the Elder Board of First Evangelical Free Church. These agreements allow NPBS to provide Charitable Contribution receipts to those who support the Seminary. These agreements will remain in effect until such time NPBS has received its official independent 501(c)(3) standing. Our first class at NPBS was completed with 11 students finishing the course. This course was based on EvanTell�s evangelism method, "You Can Tell It." NPBS was provided teaching and office space in Mandan, ND. Our first home has been a blessing. Since receiving the space, much effort has gone in to setting up our educational services. This involved everything a classroom requires. We have painted, remodeled, added a white board, a screen, and a projector, and we have developed our computing and internet capabilities. Two dramatic events occurred to indicate that God was moving the ministry of NPBS forward. After a couple of years of relative dormancy in the progress of the ministry of Northern Plains Bbiblical Seminary (NPBS) there has been significant activity and forward progress in the seminary's life and ministry. At the beginning of 2010, Dr. Jon Hanson, retired from his position as the Director of the Agricultural Research Service Laboratory in Mandan and began to make good on his commitment of several years to devote significant amounts of to the NPBS ministry. At about the same time, Dr. Lucas Kavlie made contact with Pastor Terry Kern (President of NPBS). Dr. Kavlie grew up in Bismarck and spent a significant amount of time in his growing up years in various aspects of First Evangelical Free Church's ministries. Starting in January 2010, NPBS has been working with Moody Theological Seminary, Chicago to bring accredited theological training to the Northern Plains. For the classes to begin, we must first find 100 individuals you think they may, at some point in time, like to take courses at a Moody site in Bismarck, ND. Out of those 100 people, we need about 30 who will seriously consider applying for entry into the seminary. If you can see the great opportunity this seminary could provide the Bismarck area, please make your interest known by registering with us. Please contact us if your are interested or know of someone who may be! Dr. Hanson and Pastor Kern met with the State Board of Post Secondary Education and was not only well received but enthusiatically encouraged to become a fully accredited educational institution offering advanced degrees. Since that time many things have been accomplished. A Certificate of Incorporation has been secured from the office of the North Dakota Secretary of State on August 3, 2007 and this represents the formal date of birth of the Seminary. North Dakota's very first Seminary got off the ground when the congregation of FEFC in Bismarck voted to affirm and endorse the founding of Northern Plains Biblical Seminary during the annual meeting of March 2007. The Counsel of Overseers named Pastor Terry Kern as its President and Dr. Jon Hanson to serve as Vice-President. Northern Plains Biblical Seminary is an educational facility with a vision to train students in the interpretation, application, and teaching of the Bible. This is accomplished by in-depth study of the Bible, applying it to one's personal life, and teaching others to do likewise. To this end, we will be able to affect the lives and ministries of those already in pastoral/teaching positions and we will train the next generation of solid Bible teachers in the truths of the Bible. "For Ezra had prepared his heart to seek the Law of the Lord, and to do it, and to teach statutes and ordinances in Israel." We have moved to our new location in Bismarck, North Dakota! In January of 2015 the space we were in was no longer available to us. TruthFellowshipLive.com grciously agreed to allow us to meet in their facilities on Monday and Thursday nights! In 2011, a very generous local business man provided a home for NPBS. We are located at 408 E Main Street, Mandan, ND; directly across the street from Gate City Bank and next door to NAPA Auto. The space has a nice classroom, conference room, kitchenette, and two offices. NPBS gets slow but sure start. 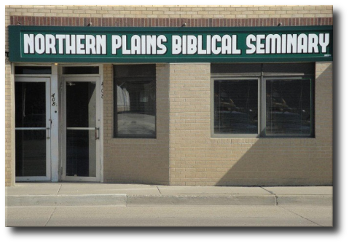 North Dakota's very first Bible School/Seminary got off the ground when the congregation of FEFC in Bismarck voted to affirm and endorse the founding of Northern Plains Biblical Seminary during the annual meeting of March 2007. The Counsel of Overseers named Pastor Terry Kern as its President and Dr. Jon Hanson to serve as Vice-President. Starting in January 2010, NPBS has been working with Moody Theological Seminary, Chicago to bring accredited theological training to the Northern Plains. For the classes to begin, we must first find 100 individuals you think they may, at some point in time, like to take courses at a Moody site in Bismarck, ND. Out of those 100 people, we need about 30 who will seriously consider applying for entry into the seminary. If you can see the great opportunity this seminary could provide the Bismarck area, please make your interest known by registering with us. To help promote the seminary, we have met several times with a core group of local pastors. We are also beginning a more aggressive campaign in hopes of securing enough interest in the NPBS to begin classes in January 2011. Our team in Bismarck remains committed to assist and serve anyone who wants to attend seminary through NPBS. You can request more information concerning the seminary by email (click here) or you can call Dr. Jon Hanson directly at (701) 390-7311.